Unlike one-off solutions like running armbands, the FlipBelt easily, comfortably and securely fits everything you need while exercising – from your large phone to your keys and other small items. Running pouches and armbands often have their own heft and can make you feel lopsided. The FlipBelt, made of lightweight, durable micro-poly and lycra, is a featherweight in comparison. The FlipBelt stays where you want it – no riding up, shifting or bouncing uncomfortably. That’s important when you’re moving. So go ahead—do jumping jacks, climb a mountain, go biking, get moving! Other belts and pouches have their own heft. Some people complain that armbands, which are fairly heavy, makes activities a little bit lopsided. The FlipBelt, made of micro-poly and lycra, is a featherweight in comparison. 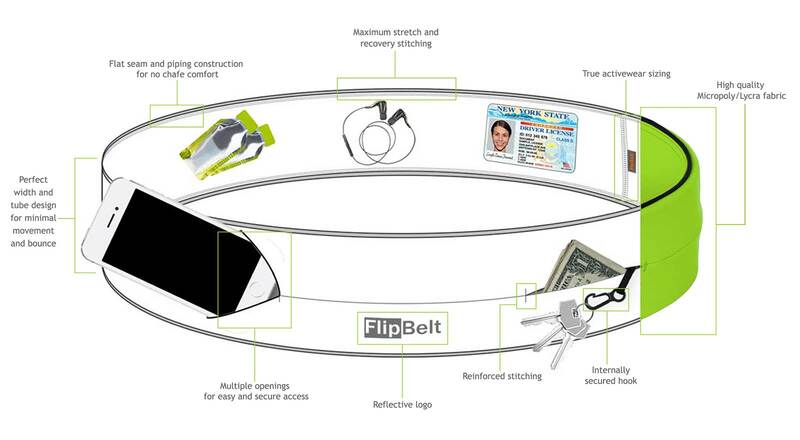 The material used for the FlipBelt is super stretchy, so it perfectly fits your waist and the things you carry. No buckles, adjustable bands or anything else to fiddle with. Phone compatibility? Most large smart phones fit! FlipBelt’s accomodate even the larger smart phones, such as the latest iPhone and Samsung models, staying flat on your body without chafing or riding up. Use while running, walking, mountain biking, climbing, at the gym.. the list goes on!